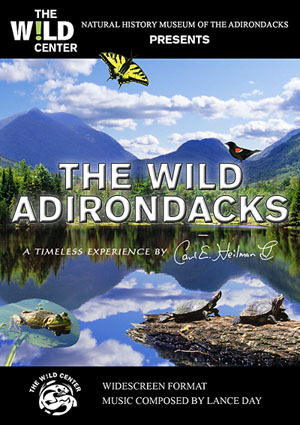 The Wild Adirondacks a multi-media presentation on DVD by Carl Heilman II The Wild Adirondacks has been viewed by tens of thousands since it's premiere showing at the grand opening of the Wild Center on July 4, 2006. It is shown daily on the 12' by 50' screen of the Flammer Theater. This awe-inspiring program features the photography of award-winning photographer, Carl Heilman II, who works with special panoramic equiptment to capture 360 degree views of the Adirondacks. His images are synchronized to a dynamic original soundtrack that was scored for this show by professional musician and composer, Lance Day. This highly-acclaimed panoramic presentation has been re-mastered to a standard wide-screen format. Bonus features include a selection of images with location captions, a segment on the Wild Center, and additional music by Lance. This DVD is a great way to bring the dramatic impact of The Wild Adirondacks into the comfort of your home. Wild Visions, released in June 2000, is an evocative program that was produced to both show viewers the beauty of the Adirondacks, and to help them feel what it's like to explore some of the wildest and most remote reaches in the Adirondacks. A combination of poetic narrative, and inspirational music by Adirondack Folk Musicians, Dan Berggren, Dan Duggan, and Peggy Eyres, is synchronized to some of Carl's finest images from his years of exploring the Adirondack Park backcountry. Larger in area than the state of Masachusetts, the Adirondack Park in upstate New York contains the greatest wilderness east of the Mississippi River. "Heilman captures the wild, brooding beauty of one of the East's greatest treasures... The vast play of his camera lens brings the region's grandeur to you with an immediacy that is only one step shy of actually being there, and fuels the passions that compel us to protect the Park." "The photography in Carl's new video, 'Wild Visions', is so achingly beautiful, so sharp, so intimate, that you will not only see - but will experience - each place, each scene, each vignette. You will walk the sprintime bogs and frozen mountaintops with him, and know the joys of an Adirondack summer, and autumn. I didn't think it was possible to improve upon Carl and Meg's first video, 'Adirondack Images', but these photographs are his best yet!" and We Belong to the Mountains. The video, Adirondack Images, contains the two multi-image / dissolve slide programs Carl produced to help celebrate the Adirondack Park Centennial in 1992. The first, shorter program offers a perspective of the creation and protection of the Adirondack Park. The second program is a combination of Carl's contemporary images, mixed with some historic images, to help give a feel for the people who live in the Park, as well as the spectacular scenery found here. the Adirondack Park Centennial in 1992.
celebration of life in the Park, and the wilderness. and Woodheat (Chuck Brumley & Karen Loffler). Plattsburgh, and have aired on Public TV stations. is available on the CD An Adirondack Celebration.